How? Well, I just couldn't get my drawing hand steady enough. 'How could this be?' You might be thinking. 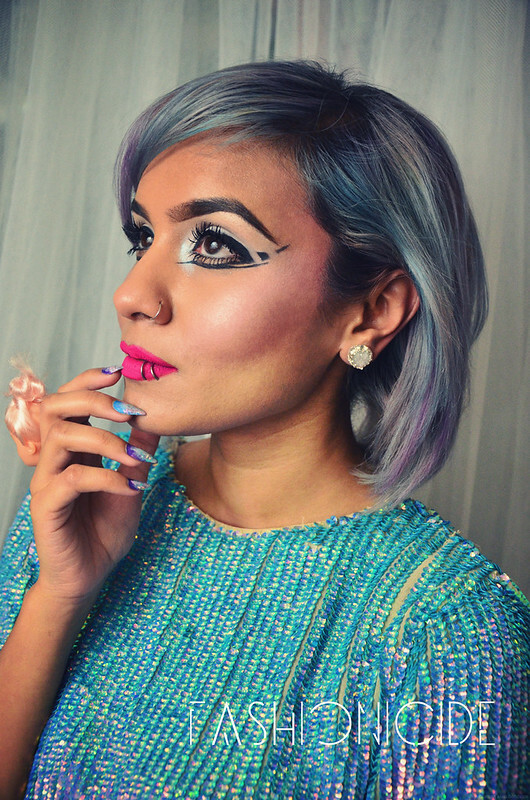 'How could it possibly be, that the queen of eyeliner couldn't keep her hand steady?' Believe me, I thought the exact same thing, and I couldn't come up with a rational answer. The best I could come up with is that my hand subconsciously recognises that if it slips near the eyes it might poke one out, but there's no such nail-related danger. But whatever the reason, my steady eye-liner hand turns to jelly when it comes to the nails, so the Negative Space Nail look failed, and it failed bad. Just recently I thought I'd give it a go again, but this time not on the nails, but with my eyeliner! How did this idea come about? Well one particular morning I was drawing on my eyeliner as usual, but I was in quite a rush. I drew on the flicks, but didn't fill it in. I checked the time again, then checked my eyes in the mirror - they looked awesome! I loved the non-filled-in wings on either side, and that's when the dreaded words "Negative Space" popped into my head! 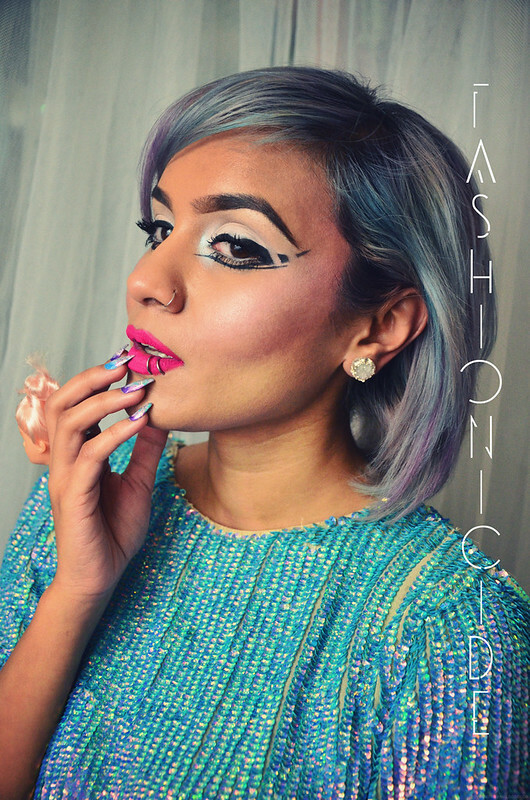 The funny thing about this look, is that it's not too different to my all-time favourite: the 60s look! The reason for that is 60s eye makeup is defined by the stark contrast between the brilliant white eyeshadow and the deep, black liner. 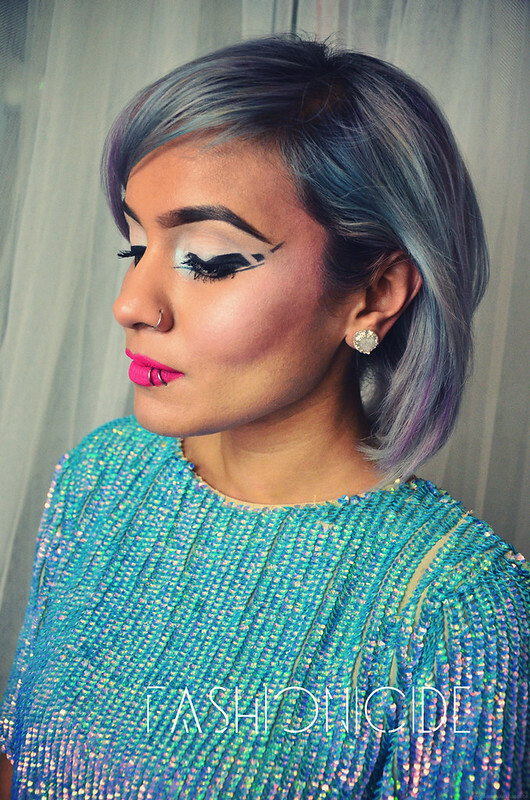 I have loved 60s Eyeliner, and Graphic Eyeliner in general for a couple of years now. It's such a classic look, I consider it my go-to now. With the negative space eyeliner, the contrast is between that same deep, black eyeliner, but instead of contrasting with the white eyeshadow, it contrasts perfectly with the empty space. The great thing about this, is you can get really creative without a great deal of effort - though of course, practice makes perfect. So, how can you achieve this look? Simple: apply your winged eyeliner as per usual, but this time you'll need an extra tool in your makeup kit - the cotton bud (or Q tip). 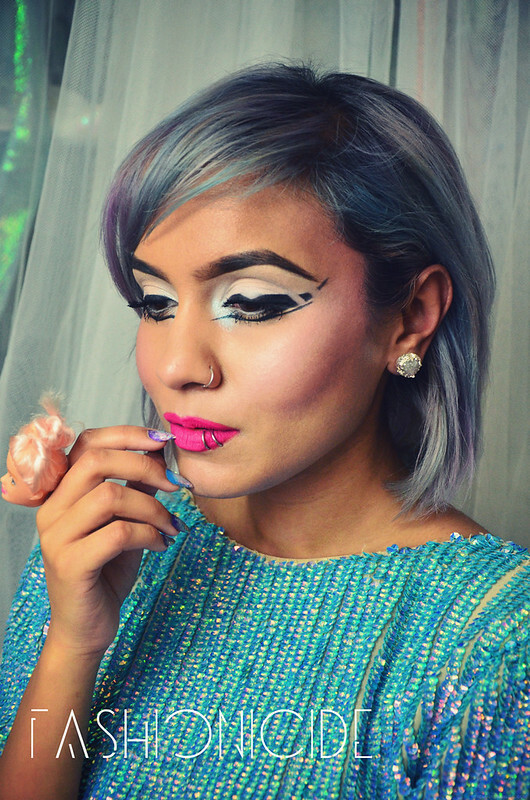 Look into the mirror at your eyeliner and plan where you'd like the gaps to be. Then simply take the cotton bud, dip it into your favourite makeup remover, then simply remove one small section at a time. Don't worry too much if it doesn't look perfect, remember the cotton bud isn't exactly a precision instrument, so it will always look a little wonky. Once you've removed a section here or there and are happy with the placement, all you need to do is get your eyeliner back out and using your eyeliner brush of choice, simply sharpen up those wonky edges. And that really is that! Pro Tip though: in the photos I have white eyeshadow applied too, which means taking a little slice out of the top liner, means you're going to need to fill that gap in with eyeshadow - trust me, that is not easy. So my advice would be to try this without eyeshadow. Yes, that's right. I murder Barbie Dolls in my spare time. For reference, I use Illamasqua's Precision Gel Liner in Infinity which I reviewed HERE using the Real Techniques Precision Eyeliner Brush - See my post on that HERE. And that really is that, it's much more simple than it looks, yet also it's very, very striking. Give it a try, and show me the results! I love this look so much! Your eye makeup makes me so jelous! Omg I love this. It kind of reminds me of when the lads in school used to shave stripes in their eyebrows! There's something super nostalgic about this. Wow this eyeliner is amazing!! And I love your top! !